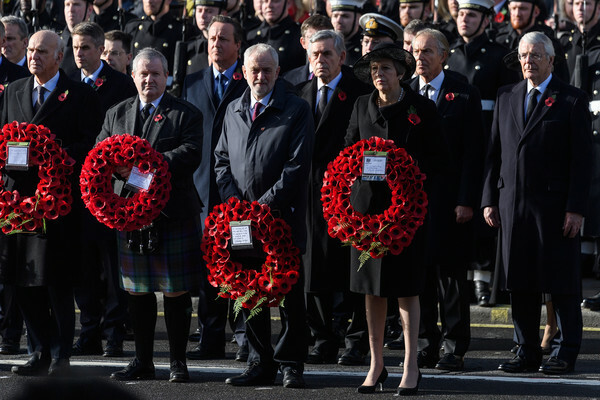 Leader of the Liberal Democrats Vince Cable, Secretary of State for Defence Gavin Williamson, Ian Blackford, Former British Prime Minister David Cameron, Leader of the Labour Party Jeremy Corbyn, Former British Prime Minister Gordon Brown, British Prime Minister Theresa May and Former British Prime Ministers Tony Blair and John Major during the annual Remembrance Sunday memorial on November 11, 2018 in London, England. The armistice ending the First World War between the Allies and Germany was signed at CompiÃ¨gne, France on eleventh hour of the eleventh day of the eleventh month - 11am on the 11th November 1918. This day is commemorated as Remembrance Day with special attention being paid for this yearâ€™s centenary.